My scratchbuilding project, the Princess Cecile corvette from David Drake’s “Lt. Leary” series of military science fiction novels, has been patiently sitting in a plastic box for two years while I dealt with other things. I haven’t forgotten it, and I did a little work in the meantime, but not enough to warrant a post. Finally, it’s moving again! 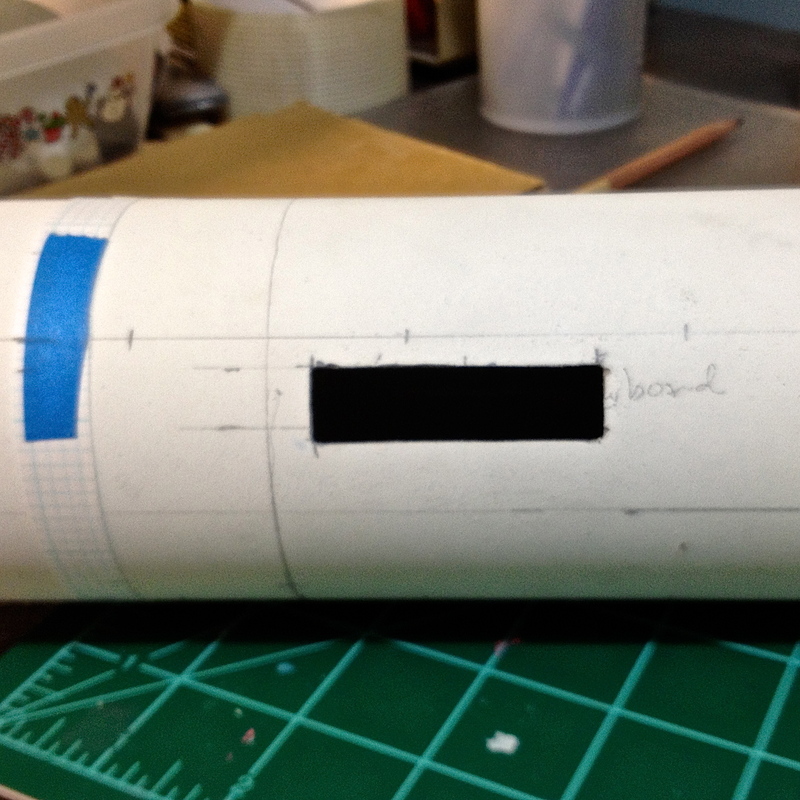 I sort of semi-arbitrarily decided on a length for the space and cut a hole in the hull with a drill and Dremel tool. 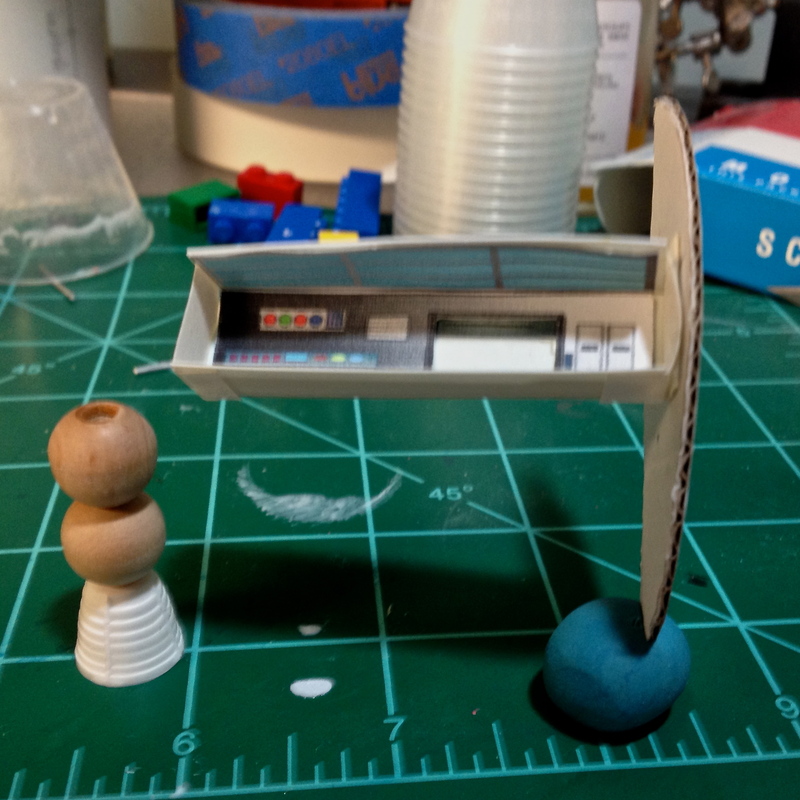 Then I sort of roughed in some panels and the hatch going to the ramp to the other decks. (In military starships in the RCN series, spiral ramps take the place of ladders or stairways; the logic is that if the ship’s hull flexes due to damage incurred in combat, the ramps are still accessible even if they are bent.) I drew it on the Mac using a drawing program and printed the plans out on paper, then glued them to thin plastic sheet and trimmed them a bit to fit the opening I cut in the hull. This test version was more for fit and visibility than anything. I don’t know if I will use any printed pieces in the final version or not, yet. In the image above you can see the beginnings of a design for a “High Drive” motor on the left. In the universe of the RCN, the High Drive motors use matter-antimatter annihilation to power the ships in space. Except for one passing mention of “the lumps” of abandoned High Drive motors, I don’t recall any descriptions of the motors in the books. So…I get to make it up! All I really need to know is (a) they are mounted on the outriggers, and (b) they mix matter and antimatter. I assume they use magnetic fields to manipulate the antimatter (anti-deuterium?) and manage the reaction, rather than just artistic license and good intentions. So I need something that looks like it has some big frackin’ magnets! We’ll see where this goes. The first design I came up with looked really stupid. Because the construction of the starships is such an odd mixture of low-tech and very high-tech – a steel hull, which can be patched and repaired by the crew on just about any planet, but a way to manufacture antimatter at need! – I’m going for a sort of low-tech, almost steampunk (“Teslapunk?”) look. So…more on these motors in another post. 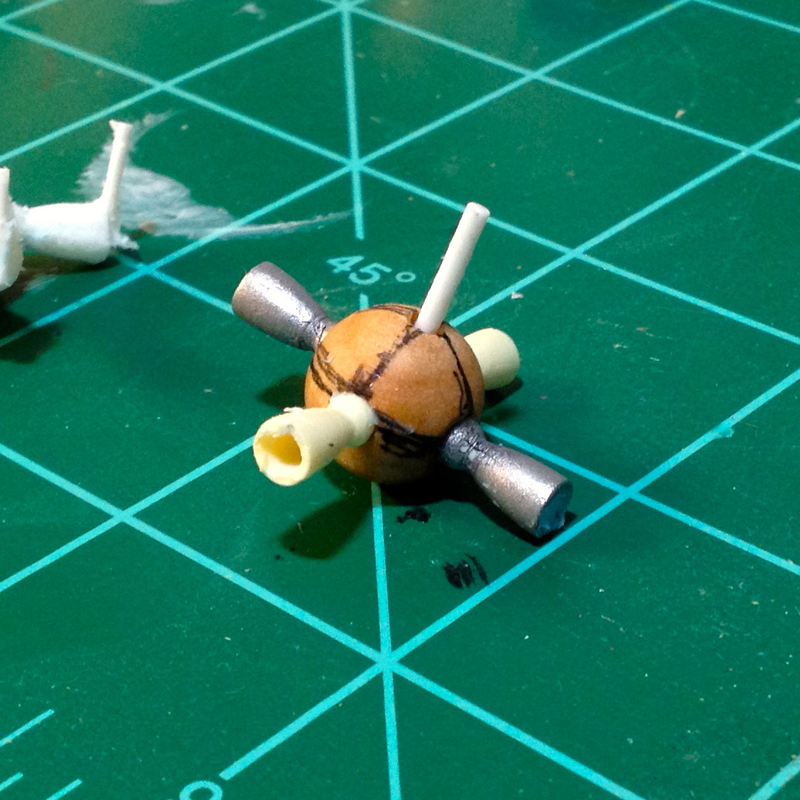 Two years ago I made a “thruster cluster” – a set of four rocket engine nozzles on a spherical mount. It looks a bit oversized, but I assume the ship won’t have a lot of them. The ship takes off and lands vertically, with acceleration rarely over 1 G, so the ship isn’t very streamlined. If it passed through an atmosphere very fast it would tear the rigging right off the hull. It won’t have a bunch of reaction thrusters built into the hull, because it doesn’t need the streamlining and it makes more sense to put them where they can be worked on more easily. Here’s the master, made from a wooden bead and rocket nozzles left over from building my Fantastic Plastic von Braun Ferry Rocket. 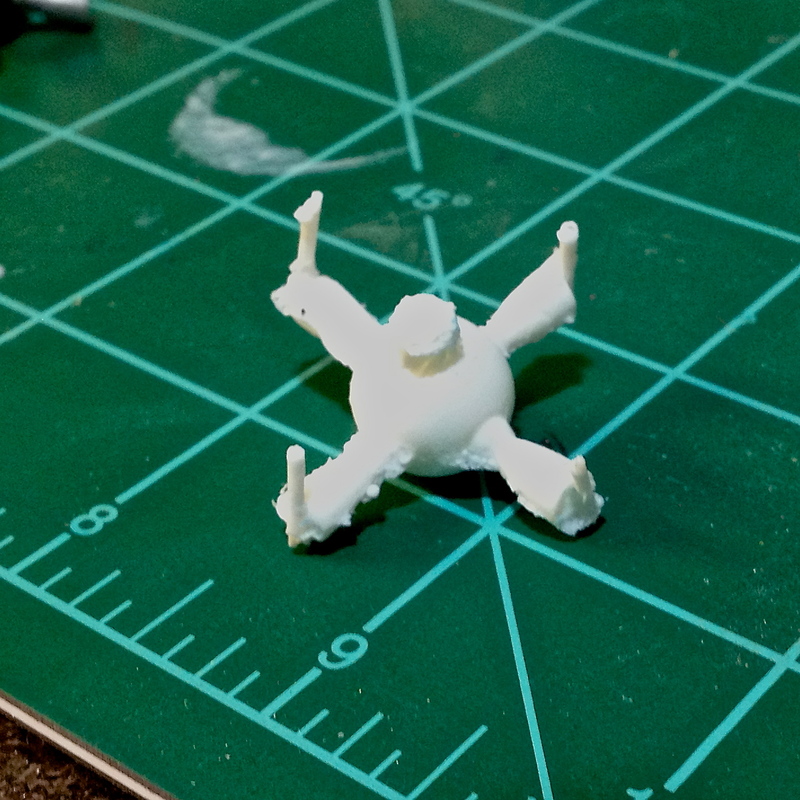 It was time to see if the Micro-Mark resin and rubber were any good after sitting on the shelf for a few years. Turns out, both of them still worked! I built a box using Legos (hat tip FineScale Modeler magazine) and seated the master in a quarter-inch layer of clay, then poured the first layer of rubber. I was concerned that if I poured the resin in from the center it wouldn’t make it to the ends of the nozzles, so before I poured the top half of the mold I inserted little pieces of aluminum wire into the bottom half at the nozzle ends. The plan was for air bubbles to vent through the resulting holes. I hadn’t made a mold in over two years, and I don’t have a lot of mold-making experience, but this morning I poured the first copy and crossed my fingers. You can see the pins on the ends of the nozzles. Before photographing this with my iPhone, I just cleaned off a little flash from around the edges. The thing will take some cleanup, but there is only one big bubble to fix, at the very end of one nozzle. I figure I need either four or six of these, so I will continue to pour some and see what I get. I was just happy the resin made it through the mold at all! UPDATE: I quickly scanned through two of the books – “Lt. Leary Commanding” and “The Far Side Of The Stars” – and the terms used for this particular opening in the ship was referred to as the “main hatch” or “entry compartment.” I’m sure that someplace there is more information, or the terminology changes from book to book. I’ll continue to dig, because now it bothers me! I also found that in the second book in the series, “Lt. Leary Commanding,” the High Drive motor(s) are described as firing from a single point instead of from several separated locations. I think that’s the only place where the High Drive is said to be a single point. I seem to recall that in the others the High Drive motors are attached to the outriggers. I’ve pondered the thruster clusters since I made the original post a couple of days ago, while I was out of town. I don’t recall thrusters really described in detail anywhere, but I recall they were mentioned a couple of times. I still don’t know if these are oversized. Each nozzle is almost as tall as a man! A warship has to maneuver quickly, however, so maybe the maneuvering thrusters would be oversized. Anyway, I think I will redo the molds. 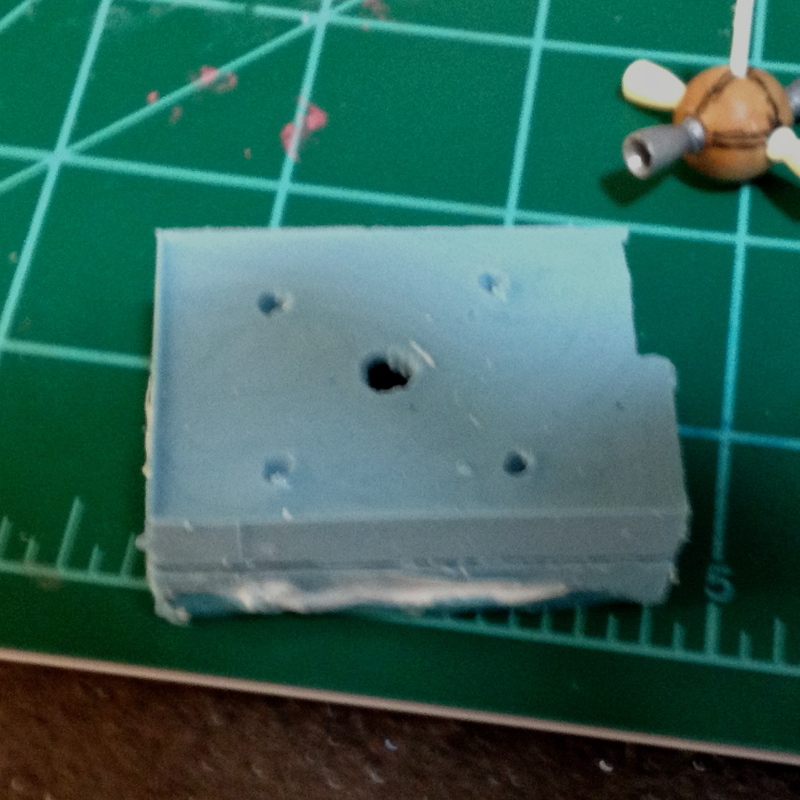 I may even try making two open-faced molds, casting the halves of the thrusters separately and then putting them together. I’d like to get a little cleaner castings if I could, and maybe that will help. The air-venting holes worked pretty well, but not flawlessly. I don’t know that I could get any better results with that mold at my current level of experience. Once I’ve tried the other mold, I’ll report on it.